The recently revived Quadrilateral (Quad) – a loose coalition between Australia, the US, Japan, and India – is evolving towards a more comprehensive partnership less explicitly focused on defence issues. 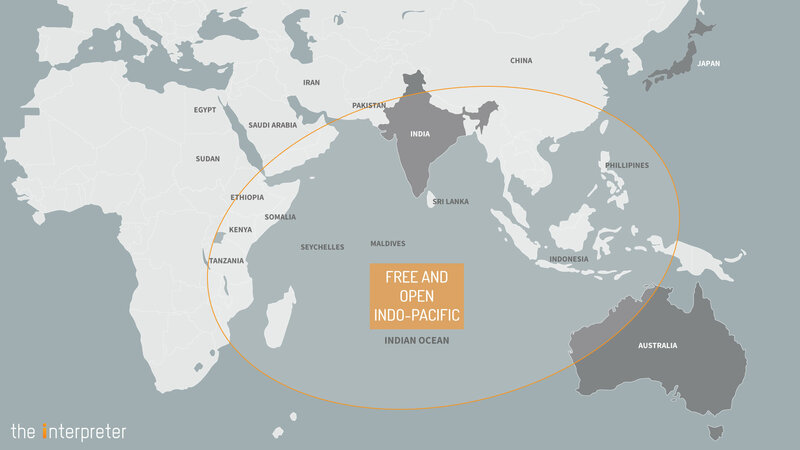 The latest idea, the Free and Open Indo-Pacific (FOIP), involves providing the region with alternatives to China’s Belt and Road Initiative (BRI). Australia can play an important role in this. China’s BRI is leading to some fundamental changes in our strategic environment. While this may be disconcerting, we need to be clear on the things Australia should be worried about. China’s plan involves building a series of new pathways westwards across Eurasia and the Indian Ocean, and has evolved to also include various infrastructure projects in the South Pacific. Importantly, the BRI is not only a series of stand-alone infrastructure projects open to all comers, but is also intended as an integrated and exclusive system. China is proposing that the BRI production and transportation system will coordinate its own customs, quality supervision, e-commerce, and other agencies. It might even have its own tribunals for the resolution of disputes. The BRI may be an attractive proposition for many countries with limited access to international funding. China’s offer to build infrastructure fast, and apparently with few conditions, could be difficult to resist. But while much of this infrastructure can be beneficial to the region, this isn’t always the case. Some enterprises are vanity projects, secured through pay-offs to corrupt leaders, and others simply don’t make economic sense. Predatory lending associated with some projects can easily create debt traps. There are also strategic concerns. Some ports and airports could be used for military purposes. There are also worries about political influence. The recent “self coup” in the Maldives where President Abdulla Yameen closed down the country’s parliament and the judiciary may in part be an indirect consequence of the BRI. A string of BRI projects in that tiny island state have delivered inordinate influence to Beijing, and possibly provided Yameen with cover to take actions he may otherwise have baulked at. The newly re-established Quadrilateral is not only an exercise in balancing China. It can also be used to create new options for countries in the region, including providing alternatives to China’s BRI right across the Indo-Pacific. Japan has been building this strategy for more than a decade. Its vision for these projects has gone by several names and acronyms, including Bay of Bengal Industrial Growth Belt (BIGB), the Asia–Africa Growth Corridor (AAGC), and now the Free and Open Indo-Pacific (FOIP) strategy. In broad terms, Japan’s vision involves developing new economic and transportation corridors from the Pacific across the Indian Ocean to Africa. As the name implies, its stated focus is on building an open and not exclusive system of infrastructure. This is far more than rhetoric. One of the region’s untold stories of recent years is of Japan’s international aid agency, the Japan International Cooperation Agency (JICA), funding the development of infrastructure across the Indo-Pacific, including major port projects in Mozambique (Nacala), Kenya (Mombasa), Madagascar (Taomasina), Oman (Duqm), India (Mumbai), and Myanmar (Yangon). India has also been a key partner in many projects. The country itself is obviously the key pivot for any activity in the Indian Ocean, and its absence from China’s BRI is a major gap in that strategy. But India has also been an important partner in projects elsewhere in the region. India played an important role in Bangladesh’s decision to award the Matarbari Port project to Japan. India and Japan are also partnering on other projects across the region, including the potential Trincomalee Port project in Sri Lanka, and possibly Chabahar Port in Iran. The Trump administration has now apparently adopted the FOIP as a useful strategy in place of Obama’s Asian rebalance strategy. It is not yet clear what the Trump administration means by the FOIP, or how consistent its vision is with Japan’s, but at least the US has endorsed it in principle. What does the FOIP mean for Australia? Australia is now considering what role it might play in the FOIP. First, the move to diversify the Quad from its focus on defence should be welcomed. Closer defence relationships are essential, but overemphasising the defence aspect can create unrealistic expectations in the region and unnecessary anxieties for China. The FOIP should involve better political coordination among Quad partners across the region. In the Indian Ocean, this could include a coordinated strategy in working with countries such as Myanmar, Bangladesh, Sri Lanka, and the Maldives. This should aim, among other things, at keeping domestic disputes at a local level rather than allowing them to spiral into wider strategic confrontations. Political problems in countries such as the Maldives should be contained as much as possible, and Australia can play a valuable political role in this. Australia needs to think much harder about what it can do to promote regional connectivity. It does not have the funding available to JICA, but Australia can deploy aid funding in modest amounts, especially in places where it can make a difference. Australia can also help facilitate development funding from agencies such as the Asian Development Bank and World Bank. It can also work better with the Quad partners in leveraging its niche expertise and technology in areas that may be important for certain projects. Without doubt, Australia can make the biggest impact in the South Pacific, which is where our Quad partners expect us to take the lead. Even if not badged as such, Australia’s funding of new undersea communications cables between Australia, New Guinea, and the Solomon Islands fits squarely within the FOIP, driven by concerns about security, development, and corruption. There has been much talk recently of China pushing unproductive “white elephant” projects in the South Pacific. Australia has strong imperatives here, as we may be the one left to pick up the pieces if small island states find themselves in debt traps. This means that Australia, in coordination with the Quad partners, needs to be on the front foot in offering attractive infrastructure projects to our South Pacific partners. Australia’s involvement in these projects will be key to shaping our strategic environment.